Posts Tagged ‘blog: cast card’. With this year’s end, so ends the program, so I thought this would be a good time to let everyone know how they might obtain some of the last few to be issued! 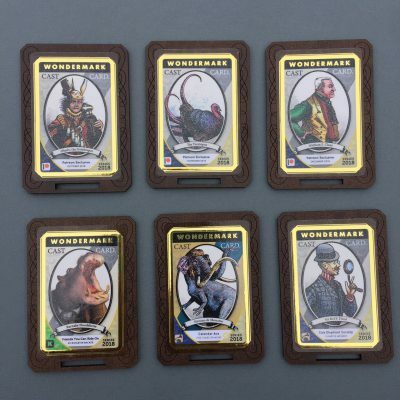 • On our Patreon, subscribers at the $21 tier are entitled to a different unique card every month! Patreon is a great way to contribute any amount to support the things you like to read, and the very kind folks who are able to contribute a higher amount are rewarded accordingly. Pictured above in the top row are the October, November, and December cards. There are still a few days to qualify for the December card if you like – just be in that tier by the end of the month. The December card is Bill Claus, from the holiday storyline a few years back. And that’ll be it for the subscription tier! That tier will be morphing into something different in January. 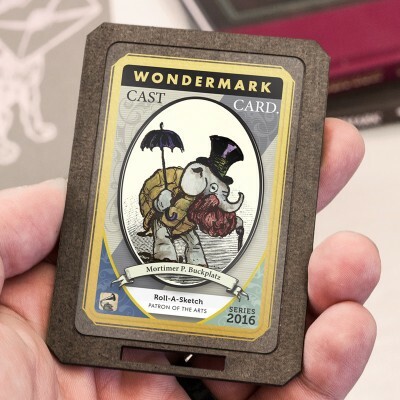 • Then, there are two Wondermark Calendar-related cards: Sir Kel F. Finnt is awarded to anyone who gets a copy of this year’s calendar AND/OR a copy of the new The Elephant of Surprise mini-collection, both of which are still available while supplies last. • If you qualify as a Calendar Ace (a patron of that product five or more times over the years), then don’t forget to claim that card as well when you make your order this year, if you haven’t already. • And finally, there will be one last card in the spring, shipping with the next hardcover Wondermark collection, Friends You Can Ride On. If you’ve reserved a copy of that book already thanks to backing our Kickstarter, then great! You’re all set. If you missed the KS but would still like to secure a book (and card), I’ll reopen pre-orders via BackerKit in January, so you’ll have another chance! Watch for that in a few weeks. 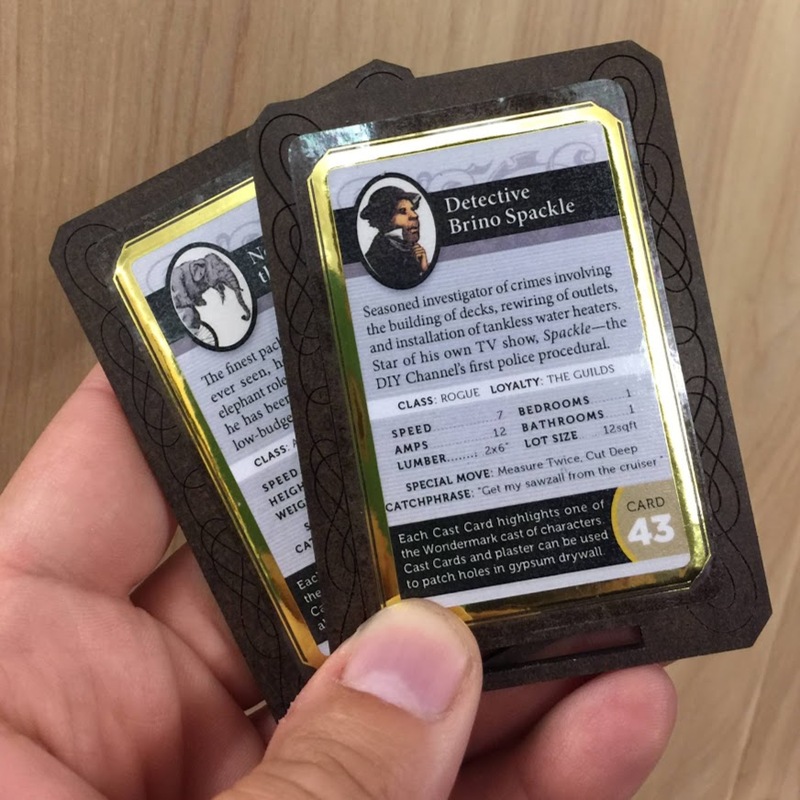 It’s been a while since I first introduced Cast Cards, so I thought maybe it’s worth a little refresher of what they are and what goes into making them. I wanted some kind of premium item to honor reader participation and accomplishments. 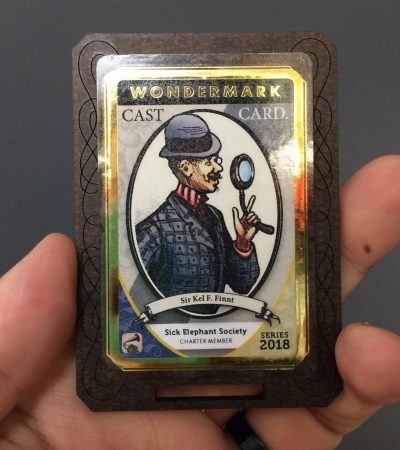 Cast Cards are mini-commemorative plaques that each feature a character from the Wondermark cast on one side, with all their relevant “stats” on the back. 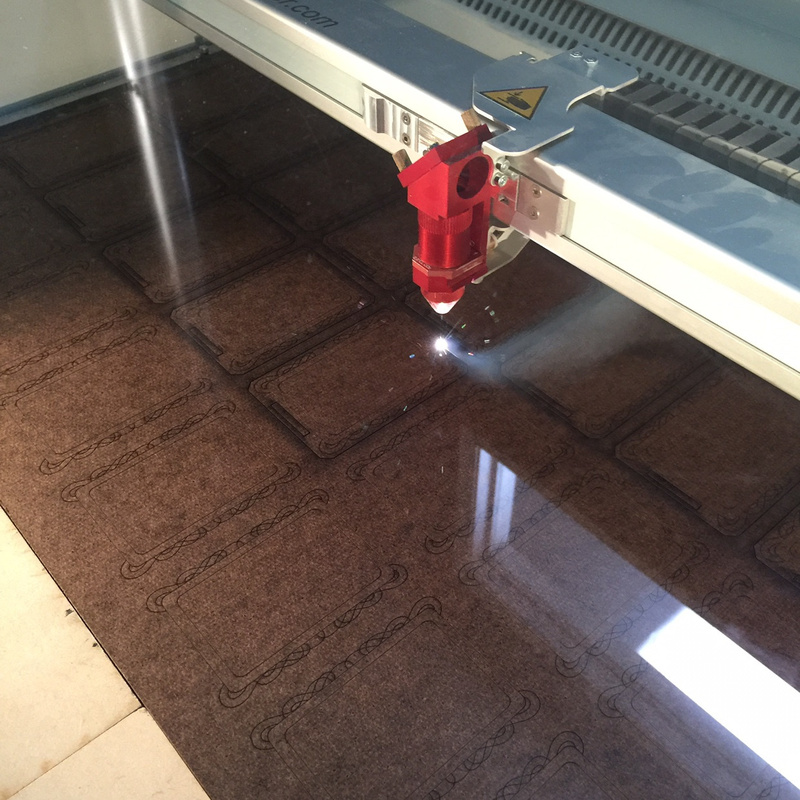 Then each individual piece is cut out with the laser! I used to do this part by hand, but why, when you have a laser??? 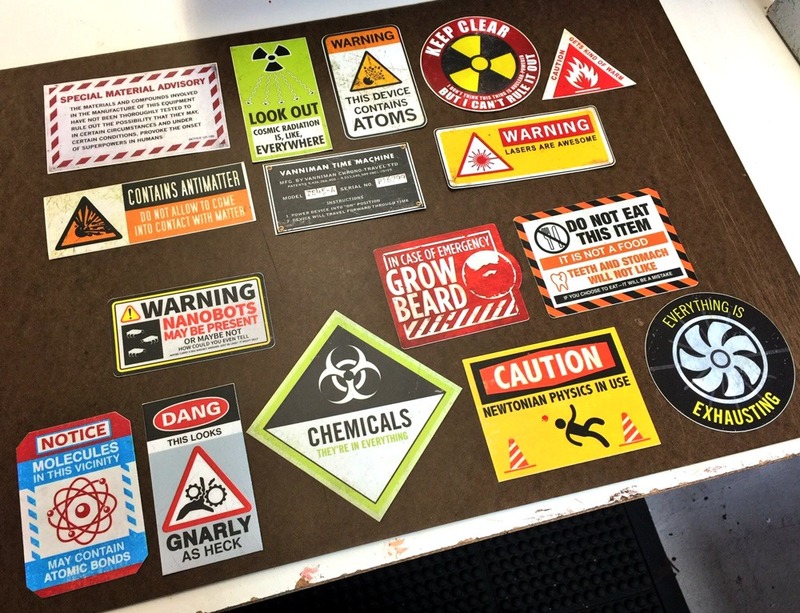 This process creates a series of individual stickers. 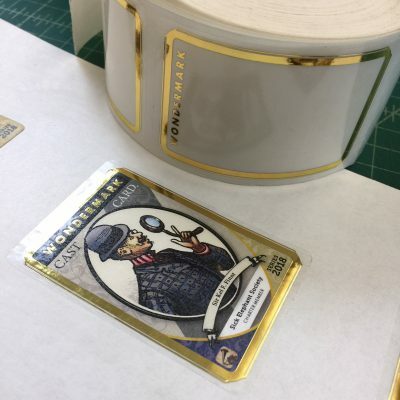 The gold foil is really the part that gives it the special touch, in my opinion! I’ll have to figure out what to do with the leftover gold stickers. Yes, I custom-made a little form for my thumb to fit onto, because it was starting to hurt putting pressure on the corner of the roller over and over. And the card is finished! 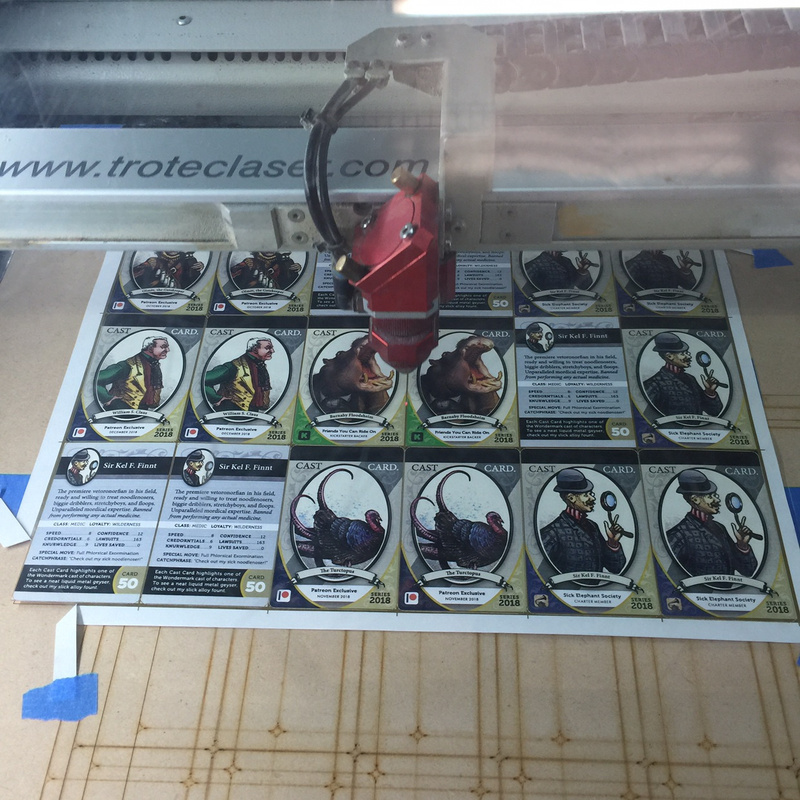 The “feet” are cut separately – each card ships with a foot, of course, so it can stand up. That’s the whole process! It is fun and satisfying but also elaborate and painstaking. I am happy to have done it for so long, but equally happy to try something new in the future. There will be 52 in all once all of these last few have been issued. If you’d like to get ahold of any of the final few, now you know how! When I blog about anything related to these last couple, I’ll say CAST CARD AVAILABLE in big letters so you know. And thanks once again to everyone who has participated so far. I hope you enjoy the ones you have!! 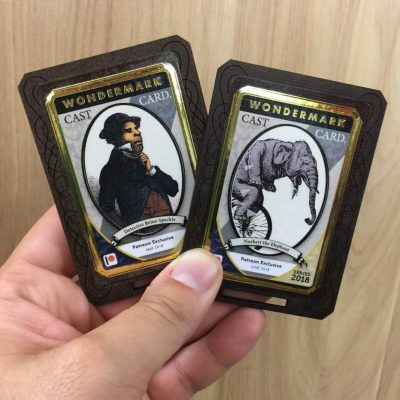 Tags: blog: cast card | Comments Off on Wondermark Cast Cards Update! The September Cast Card will feature: Gax! Since we are in the final few months of the availability of Wondermark Cast Cards (little commemorative plaques that celebrate the important moments we share), I thought I should point out that the card for September will feature celebrated terrible alien Gax. There’s a little less than a week left to claim the September card — just register for the Cast Card Subscription tier over on Patreon before the end of the month. And then I’ll send you this card — and, if you choose to remain a subscriber, another card each month until the end of the year! 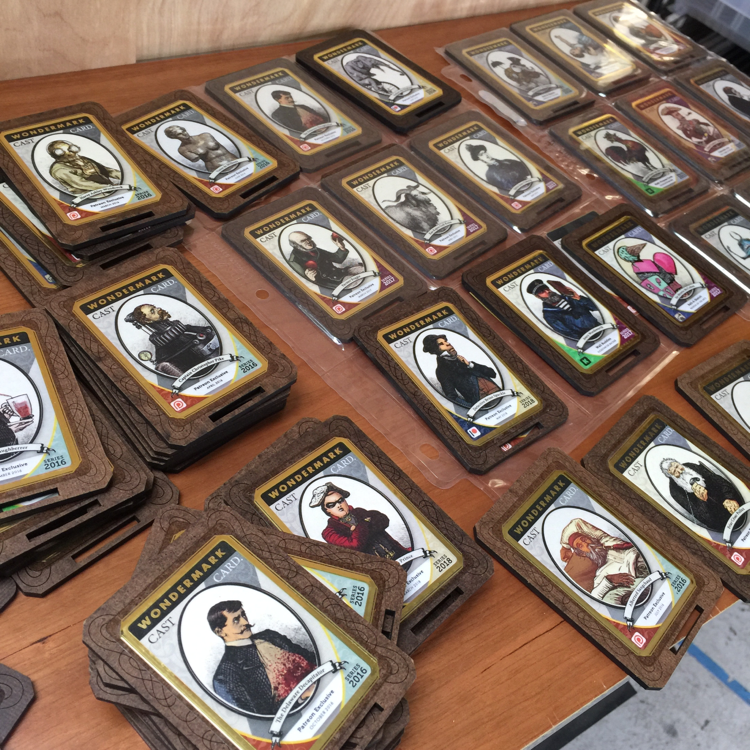 I’m drawing the Cast Cards to a close because, real talk, they are incredibly laborious to create — we assemble each one here at the workshop out of laser-cut wood, color-printed labels, and gold-foil-stamped stickers. So this will be one of your last chances to take advantage of my foolish ambition! My wrist surgery ended up being postponed due to surgeon illness, so I’ve got a reprieve of a little while to get these made and shipped for you. 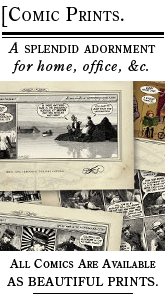 We’re also very close to the launch of a Kickstarter for the next Wondermark book — like, mere days away — and Patreon patrons (at any of our tiers) will get advance notice of that and possibly a chance to snag a book at a discount! Who can say!! Tags: blog: cast card | Comments Off on The September Cast Card will feature: Gax! 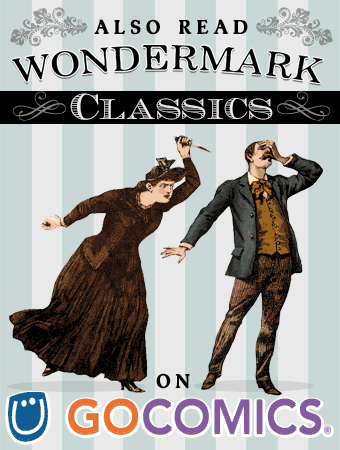 I’m podcasting the making of the next Wondermark book! This post has a lot of big announcements in it! 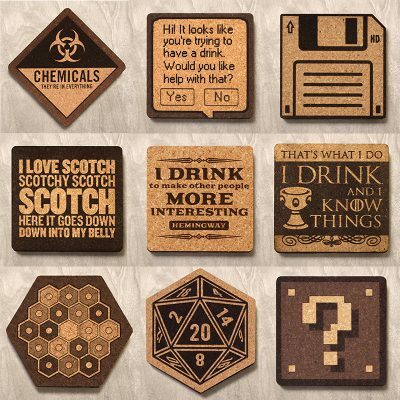 More new products in the store! A preview of my new podcast and other bonus material I’ve been posting on Patreon! An embarrassingly personal note from me. In the last post about all my new stickers and pins, I teased that there would be more new products coming to the store soon. THAT DAY HAS COME. 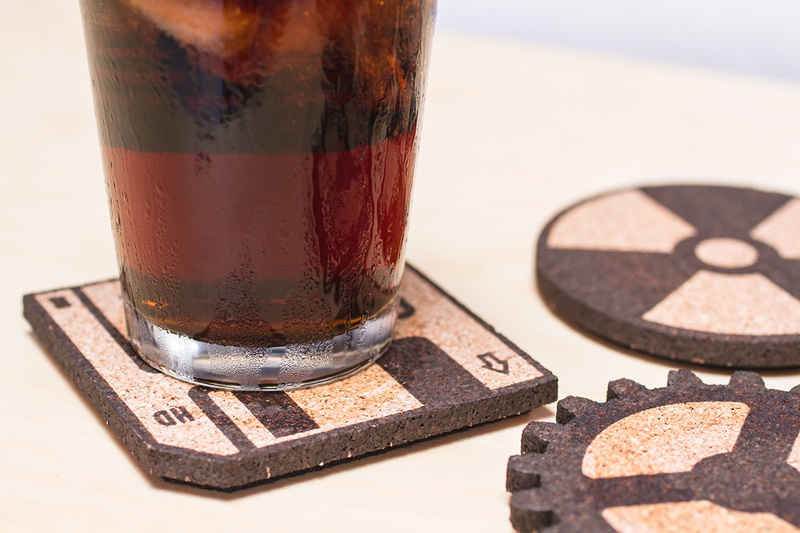 These are some of 15 different coaster designs to choose from. If you’ve visited any of my convention tables recently, you’ve probably seen these! The surface is laser-darkened cork, bonded with a central layer of acrylic for stiffness, then backed with a sheet of soft felt made out of recycled soda bottles. 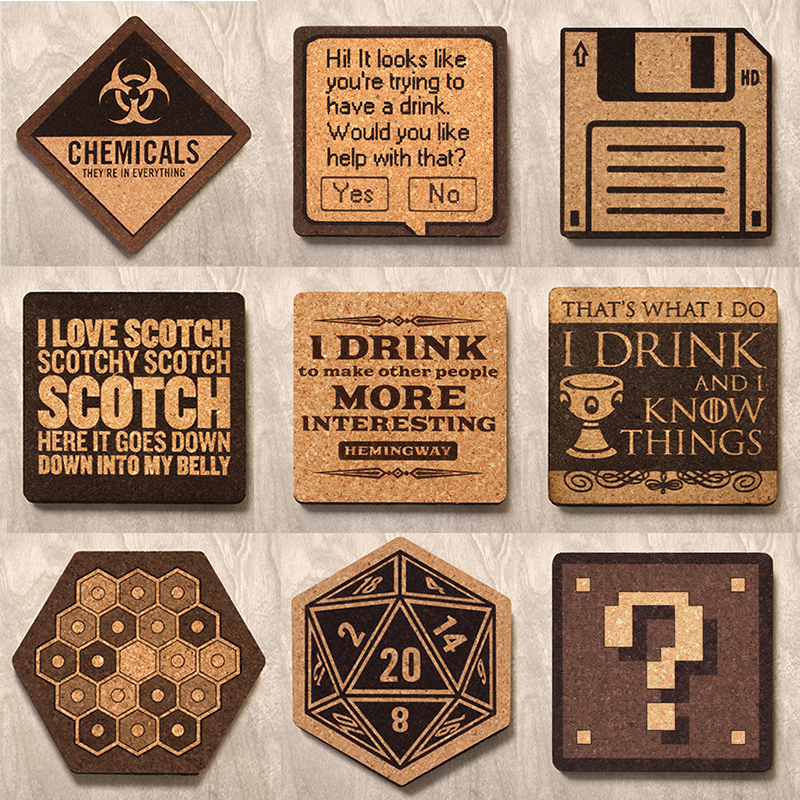 I now have a selection of them in my store, along with some wooden magnets made using the very same laser. There’s bonus content available on Patreon! I’ve started a new podcast, and you’re invited! 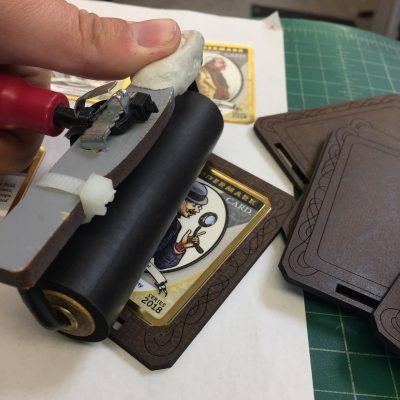 It’s called “Malki on the Mark”, and it’s all about the making of the next Wondermark strip collection. The podcast will be a sort of journal related specifically to the design, production, Kickstarting, printing, and fulfillment of this particular project. You’ll get to follow along through the entire process as I explain all the things that are happening behind the scenes with the production of the book, and the decisions being made along the way, that I normally wouldn’t bother to share (but that end up making up most of the actual process). My hope is that you’ll find it interesting to follow along as I embark upon a project that will be sure to have lots of twists and turns! Well, this time I’m doing it. 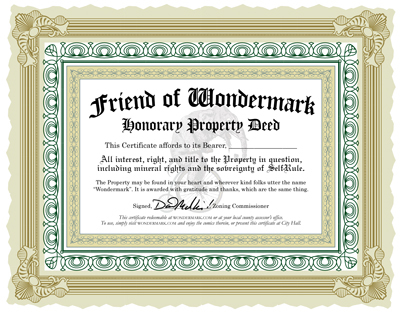 As I explain at greater length in the post I’ve quoted above, the podcast will be a reward for folks who support Wondermark by becoming monthly patrons. I’ve posted six episodes so far. Sometimes it’s just me talking in EXCRUCIATING DETAIL about book design, and other times it’s me talking with a comics-making pal! To give you a sense of it, I’ve made Episode 4 (featuring a discussion on Kickstarter reward strategy with Sam & Fuzzy‘s Sam Logan) free for everyone. It’s 43 minutes long. 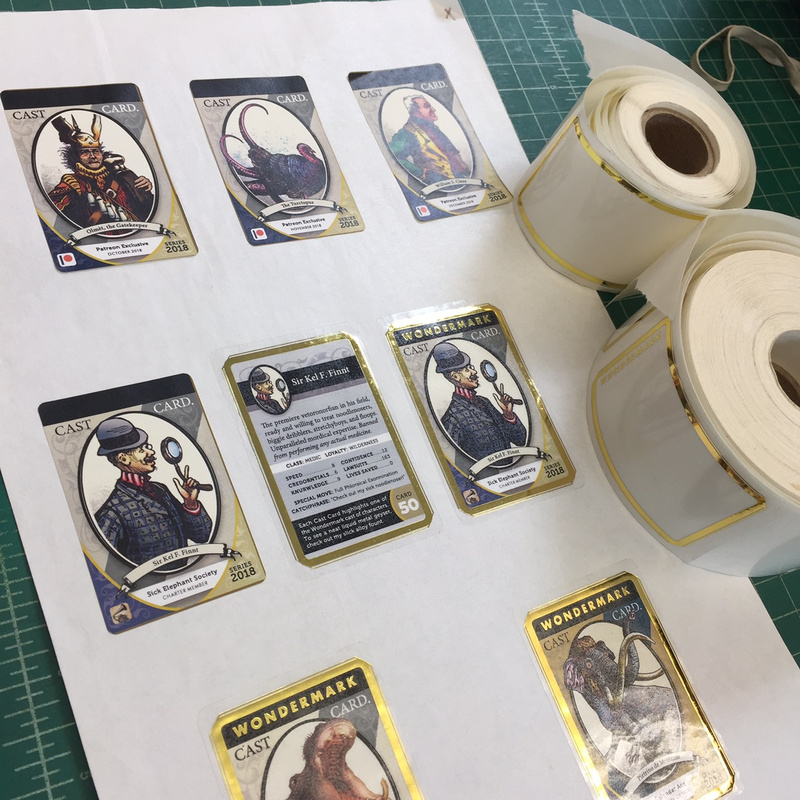 • 2 Minutes to Wondermark — timelapsed screen recordings (with after-the-fact commentary added) of me making each Wondermark strip. Back in January, I started screen-recording the making of (almost) every comic, and with these commentary videos, I’m showing you the process. 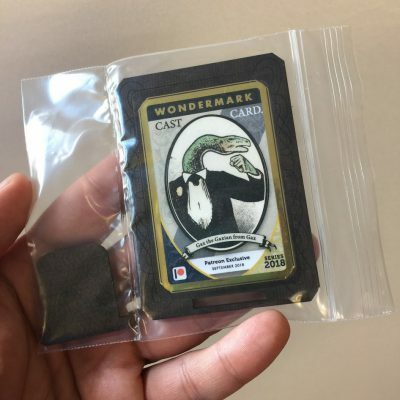 • Archive Dive — in which I look back at various individual comics from the past 15+ years and explore common themes at absurd length, such as “Five Wondermarks Based on True Events” and “Five Wondermarks that Foresaw the Future”. • From the Roll-a-Sketch Vault — basically the same thing, but talking about what went into some of my favorite Roll-a-Sketch drawings, rather than comics! These series are irregular and will be added to as time allows. 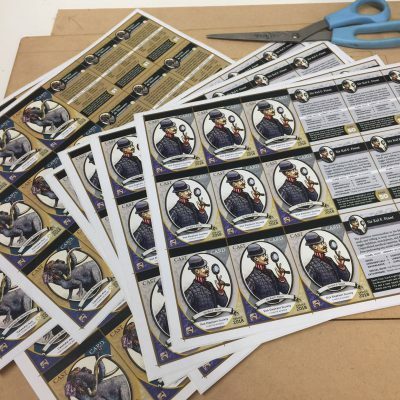 Of course you can also still get in on the final few months of Patreon-exclusive Wondermark Cast Cards — 2018 will be the last year the Cast Cards are offered. 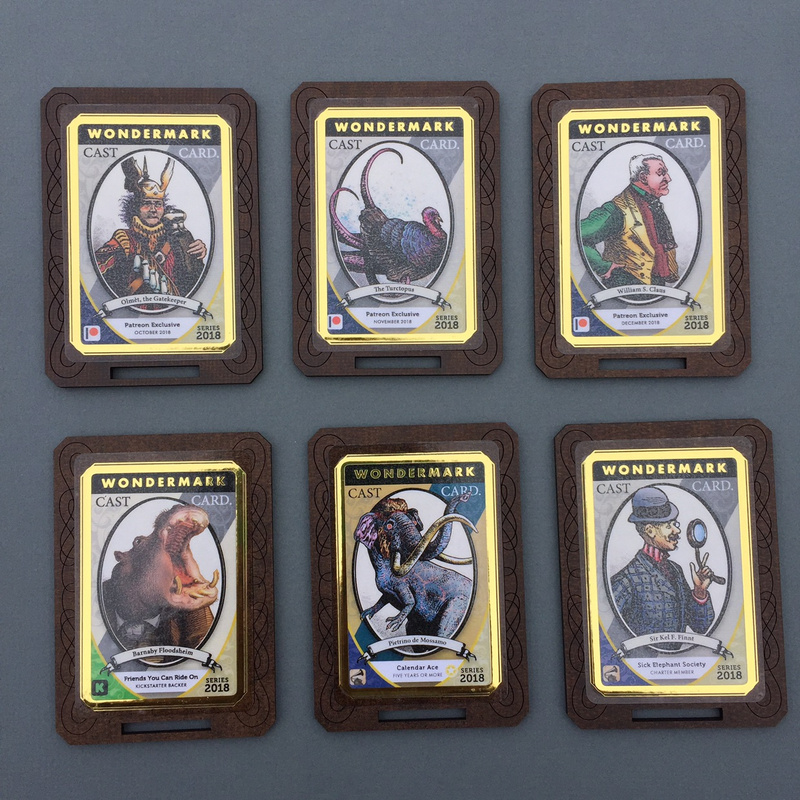 Here are a few that went out to our monthly Cast Card subscribers earlier this summer! Finally, a brief scheduling note. In a couple days, I will be having surgery to remove a marble-sized mass from my right wrist/forearm. It is (supposedly) minimally invasive surgery, but in advance I don’t have a good indication of how much it will affect my ability to work. It’s possible that my dominant hand will be immobilized for a period of some weeks. I’m sure I will still be able to fill orders from the store, and I expect to figure out a way to make and post comics on something like a regular schedule, but just in case, I ask for your understanding in case the typical posting schedule ends up suffering somewhat. I am a bit nervous about the upcoming recovery period (and the upcoming absurd medical bill, because we live in America), but the truth is I won’t know anything definitive until it goes however it’s going to go! Anyway, friends, let’s be real, this is a definitely a good time to pick up something from the store, or the other store, or to become a patron. Thanks for reading down this far!! 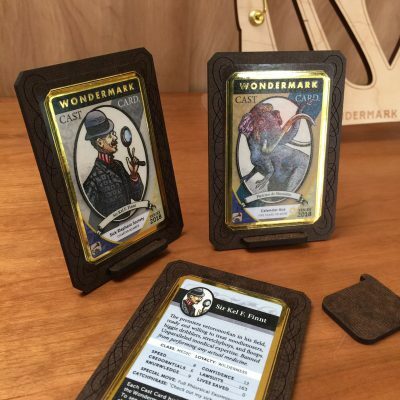 Tags: blog: cast card, blog: product announcements | Comments Off on I’m podcasting the making of the next Wondermark book! NEXT WEEK: Seattle! 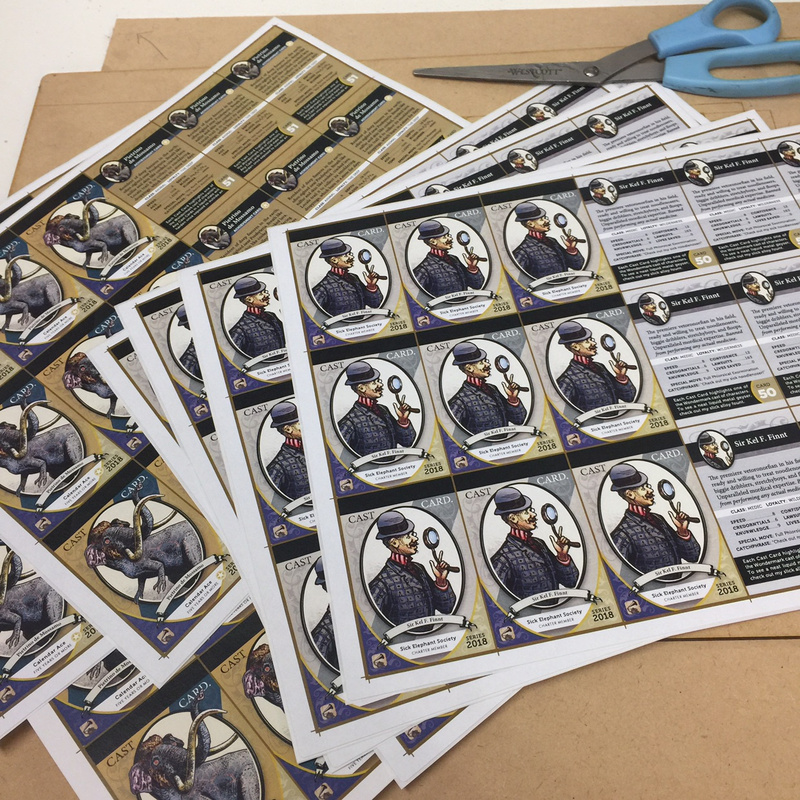 With new stickers & Cast Cards! They will be available at my table at the Emerald City Comic Con (née Comicon) next week, and online in my store after that! As per usual I’ll be at the TopatoCo booth, #1102, on the skybridge, alongside a dashing squad of cartoonist colleagues. The Lost in Wikipedia Game Show! Ever fallen down a Wikipedia hole? Clicking from article to article until you forget where you came from? Come watch us trap our panelists deep within the Wiki web and make them race to navigate their way back out to freedom. Featuring Dylan Meconis (Bite Me), Trin Garritano (Friendshipping, Cards Against Humanity), James L. Sutter (Pathfinder, Starfinder) and Dave Kellett (Sheldon, Drive), and hosted by David Malki ! (Machine of Death, Wondermark). I’ve just updated the Cast Cards Index Page, showing off the 40 different cards released or planned to date — including past years’ Roll-a-Sketch cards (claimable in retrospect if you got a sketch from me in 2016 or 2017), Patreon cards, and special Achievement Cards. We award participants a card with every big project released (such as a Kickstarter or our annual calendar), and in the year to come, there will be a few new Achievement Cards available as well — I’ll hold another caption contest next month, for example! Our subscribers on Patreon have been the main recipients of the Cast Card bounty, with a brand new card every single month. In fact, I’ve just sent subscribers the January 2018 card — and there’s still a few days left to claim February’s (Dandra P. Wrentzling, pictured above) for yourself if you like, by becoming a Patreon subscriber at the appropriate tier before the month is out. 2018 will see the release of the FINAL BATCH of Wondermark Cast Cards, so join us for the home stretch! Tags: blog: appearances, blog: cast card | Comments Off on NEXT WEEK: Seattle! With new stickers & Cast Cards! 2 New Cast Cards for March! 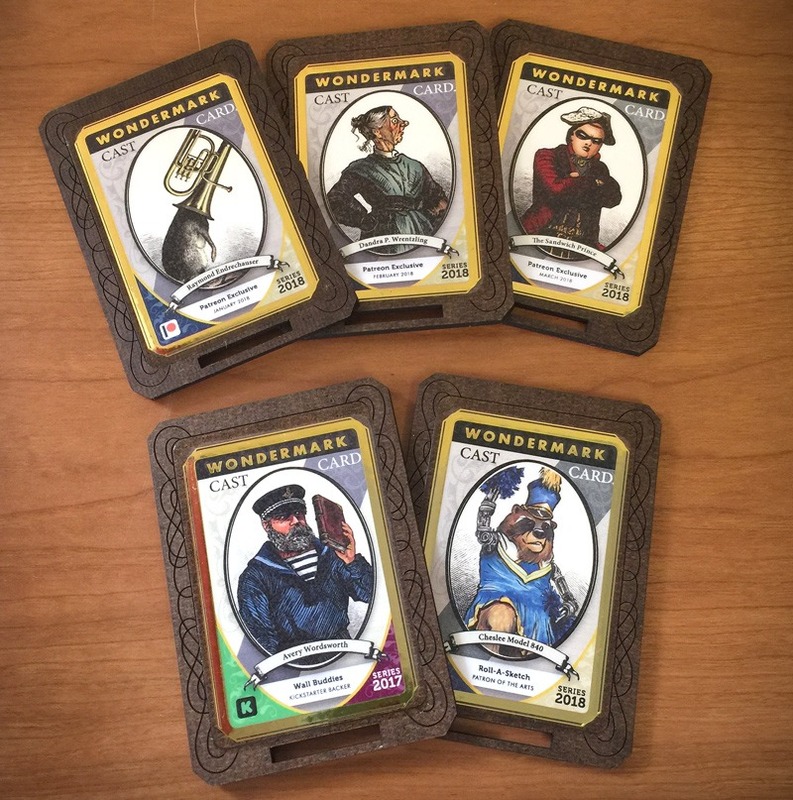 I’m very excited about these two new Wondermark Cast Cards! For reference, I’ve set up a permanent index page of all the cast cards released to date. These two new ones are cards #7 and #8. Card #7, below, features Herve Ashley-Woodcock, of classic Wondermark episode #378 (also known as the “Jinx bear one”). If you hop on the subscription tier right now, you can still stake a claim on March before the month is out, and claim a copy of Herve for your very own mailbox. 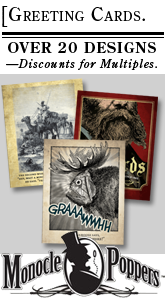 Card #8, at the top of this post, is good ol’ Professor Buckplatz, of Roll-a-Sketch! You may also recognize his august visage from the 2014 Wondermark Calendar. The Professor will be a convention exclusive card, for now. If you come say hello at any of my shows this year, you can claim a copy of the Professor by commissioning a Roll-a-Sketch. SPECIAL CONVENTION BONUS NOTE: Our online promotion for the Library Ace Cast Card has now closed. 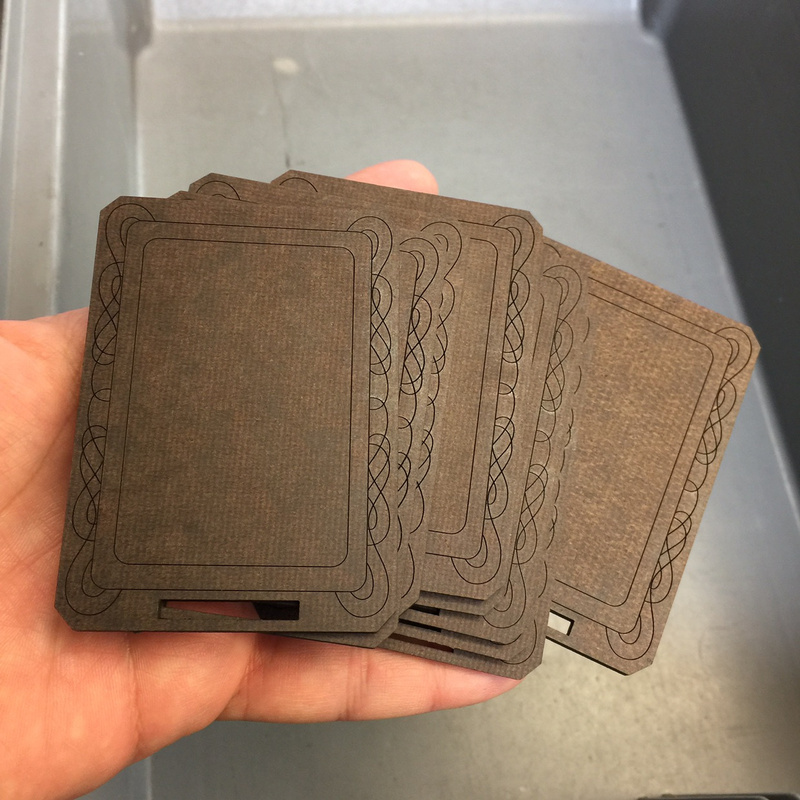 BUT, I will bring a handful of the Library Ace card to conventions! If you pick up five books, or can demonstrate that you have five books at home (by showing me a photo or something like that), I will proudly award you the Library Ace card, then and there. Both the Roll-a-Sketch card and the Library Ace card will be accompanying me to all conventions in 2016 (starting with AnomalyCon in Denver, this very weekend!). Other, different cards will continue to appear throughout the year. In what contexts or paired with what offerings, who can say??? Not me, because I have not planned that far ahead just yet. But I have figured out these two!! 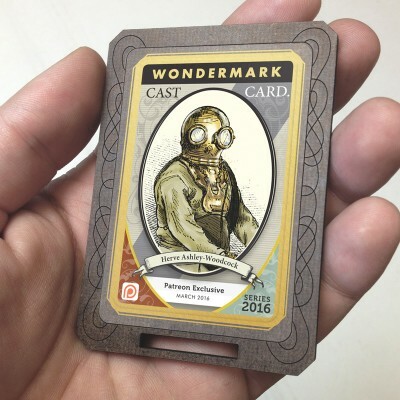 Join the Cast Card Subscription Tier on Patreon (or any other tier that you like), and help support Wondermark! You will be recipient of my most earnest gratitude. Tags: blog: cast card | Comments Off on 2 New Cast Cards for March!